The surface of the planet Mars tilted by 20 to 25 degrees 3 to 3.5 billion years ago. This was caused by a massive volcanic structure, the Tharsis volcanic dome (1), which is the largest in the Solar System. Because of its extraordinary mass, it caused the outer layers of Mars (its crust and mantle) to rotate around its core. The discovery of this huge shift changes our vision of Mars during the first billion years of its history, at a time when life may have emerged. It also provides a solution to three puzzles: we now know why rivers formed where they are observed today; why underground reservoirs of water ice, until now considered anomalous, are located far from the poles of Mars; and why the Tharsis dome is today situated on the equator. These findings are published on 2 March 2016 in the journal Nature by a mainly French team including researchers from Gosciences Paris Sud (CNRS/Universit Paris-Sud), Gosciences Environnement Toulouse (CNRS/Universit Toulouse III Paul Sabatier/IRD) and the Laboratoire de Mtorologie Dynamique (CNRS/cole polytechnique/UPMC/ENS), together with a researcher from the Lunar and Planetary Laboratory (University of Arizona, US). Mars hasn't always looked like it does today. Some 3 to 3.5 billion years ago, the planet underwent a huge tilt, which has now been identified thanks to the combined work of geomorphologists, geophysicists and climatologists. It wasn't the rotation axis of Mars that shifted (a process known as variation of obliquity) but rather the outer layers (mantle and crust) that rotated with respect to the inner core, rather like turning the flesh of an apricot around its stone. This phenomenon had been predicted theoretically(2) but never demonstrated. The tilt was caused by the gigantic Tharsis volcanic dome, which first started to form over 3.7 billion years ago at a latitude of around 20N. Volcanic activity continued for several hundred million years, forming a plateau exceeding 5,000 km in diameter, with a thickness of about 12 km and a mass of a billion billion tons (1/70th the mass of the Moon). This mass was so huge that it caused Mars' crust and mantle to swivel around. As a result, the Tharsis dome shifted to the equator, corresponding to its new equilibrium position. So before this tilt, the poles of Mars were not in the same place as they are today. In 2010, Isamu Matsuyama (University of Arizona) had already used a geophysical model to show that, if the Tharsis dome is removed from Mars, the planet takes on a different orientation with respect to its axis. In this new study, geomorphologists Sylvain Bouley (Universit Paris-Sud) and David Baratoux (Universit Toulouse III Paul Sabatier) show for the first time that the rivers were originally distributed along a south tropical band on a planet Mars that rotated around poles shifted by about 20 degrees with respect to their current positions. These poles are consistent with those calculated independently by Matsuyama. This remarkable correlation is supported by observations by other scientific teams who had already observed traces of glacier melting and retreat, as well as evidence of subsurface ice, in the former polar regions. Such a shift would have had a significant impact on the appearance of the planet, whose topography in this early configuration was recalculated by Matsuyama with the aim of examining the effects of the relief on primitive Mars. This study radically changes the generally accepted scenario, according to which the Tharsis dome was thought to have mainly formed before 3.7 billion years ago and to have existed before the rivers, since it controlled their flow direction. On the basis of the calculated topography, Bouley, Antoine Sjourn (Universit Paris-Sud) and Franois Costard (CNRS) have shown that despite the different relief, with or without Tharsis, in both cases most rivers would have flowed from the cratered highlands of the southern hemisphere to the low plains of the northern hemisphere. This observation shows that the rivers could have been entirely contemporaneous with the formation of the Tharsis dome. 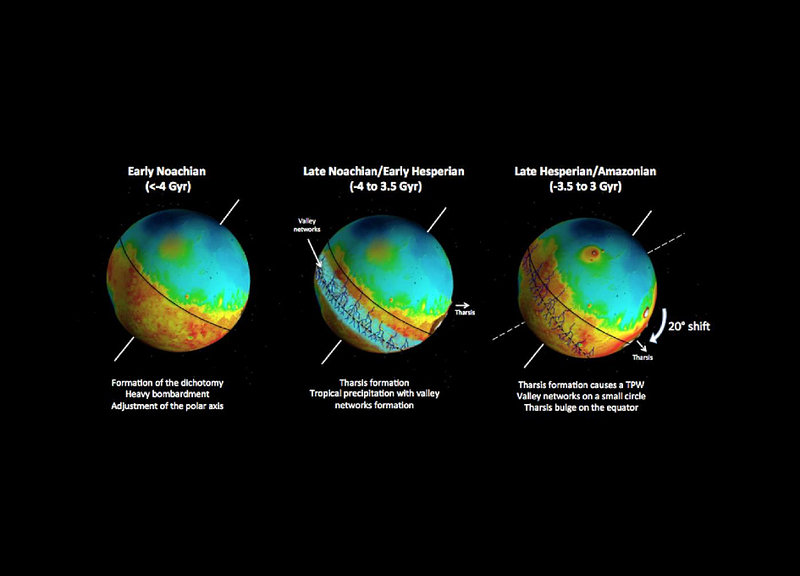 The topography of Mars before the tilt can also be used to study the early climate of the planet. Using climate models at the Laboratoire de Mtorologie Dynamique, Franois Forget (CNRS) and Martin Turbet (UPMC) show that, with a cold climate and an atmosphere denser than it is today, ice accumulated at around latitude 25S, in regions corresponding to the sources of now dry river beds. This study radically changes our perception of the surface of Mars as it was 4 billion years ago, and also significantly alters the chronology of events. According to this new scenario, the period of liquid water stability that allowed the formation of river valleys is contemporaneous with, and most likely a result of, the volcanic activity of the Tharsis dome. The great tilt triggered by Tharsis happened after fluvial activity ended (3.5 billion years ago), giving Mars the appearance it has today. From now on, this new geography will have to be taken into account when studying early Mars to look for traces of life or for an ocean, for instance. (1) In which is located Olympus Mons, the highest mountain in the Solar System (over 21 km high). (2) Such a phenomenon may have happened on other planets, including the Earth. However, on Earth, plate tectonics would have wiped out any possible traces.